Diseño Shakespear transforms the Buenos Aires subway with a bold identity and an effective sign system. How does a city derive its character—the unique qualities that define a sense of place? Every city has its own temperament, its own rhythms, and its own visual language. But how are they shaped? Some believe it is the collective personality of its inhabitants writ large in the buildings and boulevards: only hearty Midwesterners could have built the City of the Big Shoulders on its unrelenting grid. Others point to the city fathers and visionaries who oriented the built environment in its landscape and set the rules for future growth: Frederick Law Olmstead created a haven for generations of New Yorkers in Central Park. Or is it merely a chaotic tangle of happy accidents that creates a city’s identity? While the ultimate answer may be “all of the above,” there’s a certain pleasure in attempting to decode a city’s mystique. And in Buenos Aires, Argentina, many of the clues lead to Diseño Shakespear founded by Ronald Shakespear. The firm has made its mark on many facets of the city’s infrastructure, most recently the transformation of the subway system, the oldest and one of the largest underground transportation systems in Latin America. The Buenos Aires subway system began with the inauguration of the first station in 1913 at the peak of the European immigration wave that brought over 3 million new citizens to Argentina, most of whom settled in Buenos Aires and the surrounding area. The city doubled in size from 1910 to 1920 and today counts over 12 million residents or, porteños, as they are known. The Subway system grew at a corresponding pace, consolidating ownership and adding stations and lines to serve the swelling city. For the design of the map, which would become an iconic guide to the system, the team was inspired by Henry C. Beck’s 1933 diagrammatic map of the London Underground. At Beck’s time, it was a radical notion to ignore the actual topology of the subway lines and abstract the network into a more simplified and accessible geometry. By limiting themselves to vertical, horizontal and 45-degree angles, then adding an underlay of major streets above (another novel approach), the Shakespear team generated a map that was comprehensible as well as beautiful. Place it next to Massimo Vignelli’s New York Subway system map, and you discover another important influence in their work. The signs must be easy to find and their locations predictable. The signs must be easy to understand. The team used these principles to create a grid system of sign types and a hierarchy of information that could be applied to the various conditions of the system’s 86 subway stations. Station identifiers that run in bands along the tracks are always located at the same height — 2.2 meters from the platform floor — to provide optimum viewing from inside the subway car. All signs are parallel with the subway car, again for maximum visibility, except for those critical signs that guide people to the exits. They are perpendicular to the tracks and feature clear, simple messages. There are a total of 41 signs per station in a standard configuration. The visual language for the Subte is bold and concise. A palette of six strong colors are used to brand the six lines and white Frutiger type is used at various weights for optimum legibility. To balance the rigor of type and color choices, each sign is capped with a cylindrical header of the line color, providing a flourish of detail above the informational content. 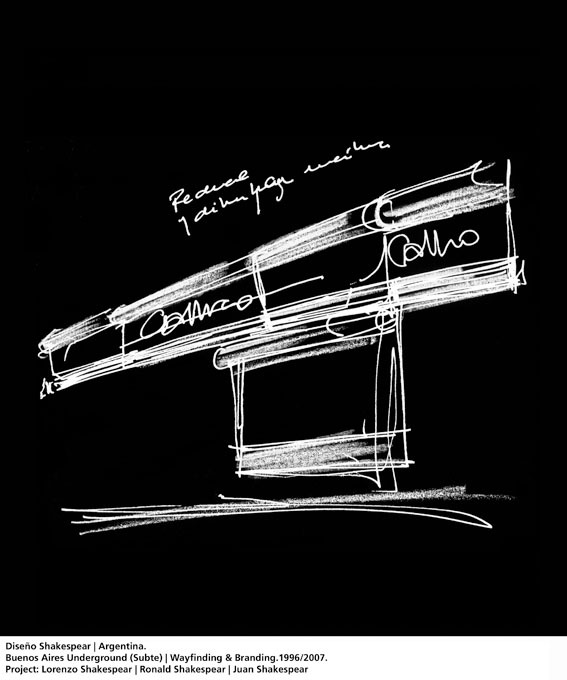 The header extends over the advertising space that punctuates each stop, providing a unifying element — or “perpetual belt” of 220 meters as Shakespear refers to it — to the station interior. He reports that it was difficult to convey the importance of this master element that repeats the station name every 2.5 meters, and yet it is one of the most reassuring elements of the system to riders looking for their stop. All the interior signage is composed of 2mm-thick aluminum panels and extruded cylinders with a polyurethane coating and applied vinyl graphics. 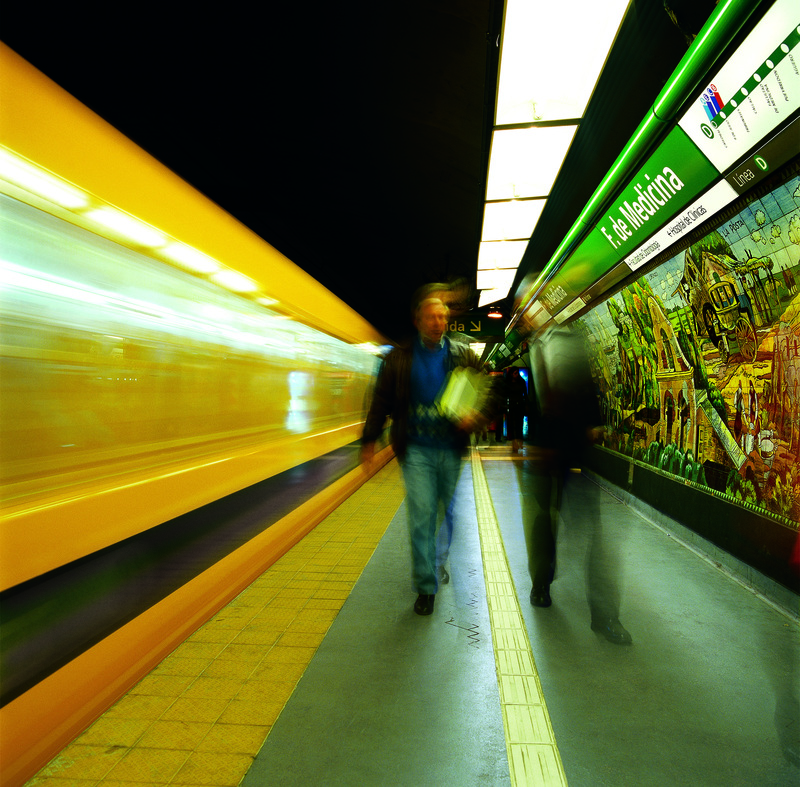 In 2006, the project advanced with the complete replacement of all exterior Subte signage. Since the oldest station is almost 100 years old, there was a great variety of subway entrance conditions and entry signage. Many entrances sported filigreed ironwork and ornate lettering. The Shakespear team chose to adapt the visual design elements used in the interior signage, reassembling them in the grand scale required to identify stations on Buenos Aires’ busy streets and wide boulevards. The circle that identified the various lines on interior signage was made three dimensional and illuminated to become a recognizable beacon hovering above the streetscape. The cylindrical caps were rotated to become pillars supporting the spherical landmark. This economy of design appears effortless, as if it were the only logical conclusion to the design problem at hand. Exterior entrance signs are composed of sign boxes formed by standard aluminum extrusion and double faced acrylic signs illuminated internally with long-life lighting elements chosen high visibility and low maintenance. Each entrance features a color vinyl system map illuminated from behind and mounted in aluminum frames and iron columns. For both the internal and external elements, the fabricator, Acrílicos Atlas SA. 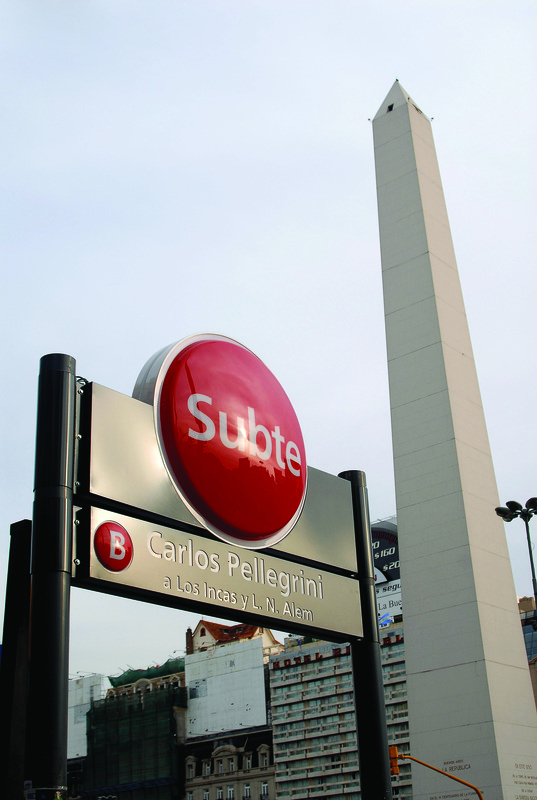 of Buenos Aires, led the substantial fabrication and installation effort totaling over 3,500 signs in all. In a city where the bus system can take years to master, the Subte is recognized as the easiest way to navigate a city known for the widest streets in the world — and a fair share of traffic congestion. A large part of that ease comes from the absolutely clear visual structure of Diseño Shakespear’s wayfinding system. Leslie Wolke (leslie.wolke@gmail.com) is a consultant who specializes in interactive wayfinding and donor recognition systems. 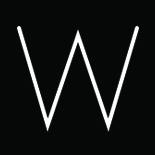 Based in Austin, Wolke writes about design and architecture. She had the pleasure of meeting Ronald on a recent trip to Buenos Aires. With her husband and her Subtepass, she traveled all the major lines like a porteño. Victor Levy Ing. / Watson&Levy / Legal Consultant. Fernando Estevez / Fabrication Consultant.